Overview: 10 paintings by Dutch artist Judith Leyster were shown with 15 works of art by her contemporaries in this exhibition commemorating the 400th anniversary of Leyster's birth. Included were paintings by her presumed teacher Frans Hals and her husband, Jan Miense Molenaer. Musical instruments on loan from the Library of Congress, the Folger Shakespeare Library, and a private collection also were on view. The European version of the exhibition at the Frans Hals Museum included additional works from European collections. Arthur K. Wheelock Jr. and Frima Fox Hofrichter presented a lecture, Judith Leyster: A "Leading Star" in Dutch Art, on October 25. A concert of baroque music from the Netherlands was presented on October 21. Organization: The exhibition was organized by the National Gallery of Art. Arthur K. Wheelock Jr., curator of northern baroque painting, National Gallery of Art, was curator, in consultation with Frima Fox Hofrichter, professor, history of art and design, Pratt Institute, New York. Sponsor: The exhibition was made possible by Mr. and Mrs. Thomas A. Saunders III. The brochure was supported by Mrs. Henry H. Weldon, with additional support from Mrs. George M. Kaufman. 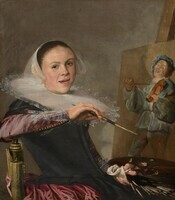 Catalog: Judith Leyster, 1609–1660 by Frima Fox Hofrichter. Washington: National Gallery of Art, 2009.